Blogging world!! It has been wayy too long since I last posted to my blog, and I give my most sincere apology. When I first started blogging, I was finding that I had a lot of spare time at my job. However, I stopped blogging whenever my company imposed a new "no posting to social media at work" rule. Whenever I first heard the rule, I chuckled momentarily to myself, "who would ever post to social media at work? Sounds risky." (I am not on Facebook or Twitter - shocking? Liberating.). Anyways, it took about 3 days for me to realize that posting on a blog was technically "social media". And yes, I'm a Type A personality so "technically" totally matters to me. And in the words of a viral YouTube video, "ain't no body got time for that" was how I felt about posting when I got home. People, I have a house, dog, husband to take care of! (: I only smile because it pales in comparison to what most people have, to all you super heroes out there - lots of respect for you. And to all of my followers, I'm sorry for not making the time. No reflection on how much I appreciate you reading and connecting with my thoughts. OFFICER AND I WILL BE MARRIED ONE YEAR ON SUNDAY. Insane, right? I don't know where this year has gone. It's been so jam packed with excitement that I think I could write a book (or at least this blog). We are sticking with traditional wedding anniversary presents and the first year is paper. I have to be honest, I'm totally struggling. I would have done like a picture or something, but I just gave him a photo for Father's Day. (No, there are not any Rookie, Jr's but there is Scout dog - or has it been so long that you have forgotten her? Well, in our household she counts as a reason to celebrate Father's Day). Any ideas for a first anniversary present? I will wrap this first post up on my soap box (what kind of police wife blogger would I be if I didn't put something related to police work on my first blog back in the game?) I read an article today about an accident on a highway where a semi was over turned. A girl was driving past and not paying attention (texting, perhaps? You know how I feel about that, if not, please check out the post IT CAN WAIT), when she hit one of the clean up crews vehicles and caused a second accident that injured herself. People please pay attention whenever you drive!! That could have been a police officer, a firefighter, construction worker, a father, sister, son! I knew people didn't pay attention when they are just flying down the highway but you think a massive amount of emergency lights and an over turned semi truck would get your head up and make you alert! Obviously not. Idiots. Well friends, I have to say. It feels good to be back. I've missed you guys. Yay! Thanks for posting! Glad you are back! 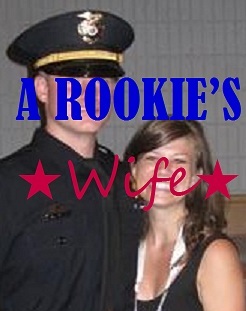 I'm so happy to have found you - I'm a new police (recruit until December) wife and have recently started blogging. We also do the traditional gifts. Cotton was harder for me - I ended up buying him pillows. But for paper I made him a custom album from Shutterfly that was only about him and a hobby he loves. What did you end up getting for him? sheepdogwife! What an exciting time you are in! I remember when officer was in the academy, it can be crazy! Thanks for connecting with me! It's always great to find other LEO wives! Can't wait to check out your blog! Oh, and I ended up writing him a love letter. (: Look back soon for my next post!